Add Your Organizing Service - Home Organize It! All Professional Organizers are invited to add your organizing service free (see below) on homeorganizeit.com, a highly trafficked organizing Web site. Have an organizing-related businesses? Add your service too! The Internet is such a great way to bring in new clients without the expense of regular advertising. When I started It's About Time Organizing Service (IATOS) in 1999, I found myself looking for the most economical ways to promote my organizing services. Not a lot of people used the Internet at that time to search for local businesses. 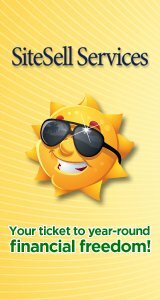 Fast forward to today and take a look at your local yellow pages book. Gone are the days when those books were used as booster seats for the kids. Yellow pages listings simply aren't doing the job like they used to for local businesses. Instead, people are using the Internet to find local products and services more than ever before. I also handed out postcards at festivals, parades and such and finally "splurged" and advertized in a small local newspaper. Then one day... it happened. My first call came in! Then a second. The first person had found my flyer and the second, saw the newspaper listing. My family and I were all very excited that I had my first clients. I'll never forget those first customers either. Actually they and many other clients eventually became my friends. That happens a lot in the organizing business, I guess because it is a very personal service when you are helping folks sort through all their belongings, memorabilia and "stuff". I went on to get referral after referral from my two happy clients and the momentum began to build. Word-of-mouth referrals carried my business for several years (note: I only ran the business part time around my family's busy schedule). Eventually though, referrals slowed and once again I found myself looking for new ways to promote my organizing business. I posted to bulletin boards in grocery stores, in school directories and on other frugal advertising platforms. Then I discovered what would change the way I got customers forever... through my own Web site. It might sound funny now, but remember, the Internet was pretty new to folks at that time. I started building homeorganizeit.com which gave me a way to not only reach new people locally who needed organizing help but to help others who were not local but wanted to get more organized. I started adding organizing and decluttering tips, ideas and strategies to the site. 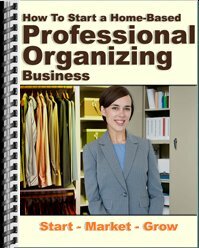 Visitors would contact me and ask me questions like what the best organizing books or products were. So I started researching (which I also love doing) and suggesting effective organizing resources. One thing led to another as I discovered that folks all over the world needed help getting organized! And many wanted to "do it themselves". Homeorganizeit.com grew into an original organizing resource which later became solely an online business. I enjoyed the benefits of working and earning from home so much that I closed It's About Time Organizing Service in 2005 and have been building my online business ever since. There is still a need for hands on organizing, of course, and that's where my "Add Your Organizing Service" section comes in. As I discovered when building this site, people everywhere need help getting organized. They need help finding a professional organizer to help them too. So, I invite you to add your organizing service listing on homeorganizeit.com. Most people like to get a feel for the personality of a Professional Organizer before hiring one. So tell them about you, your organizing style, what your specialization is if you have one and even add a photo! Add your organizing service below. There is no obligation. Of course I'd love a link to my site from yours in return but it's not required. The whole idea is to spread the word about your organizing services which are so important and needed by many. If you're a Professional Organizer or provide organizing-related services, add your organizing service in the box below, free. Go ahead, tell folks about your services, what your specializations are and even add a photo! Entering your Organizing Service Business information is easy to do.. Your submission will appear on a Web page just the way you enter it here. You can wrap a word in square brackets to make it appear bold. For example [my story] would show as my story on the Web page containing your story. Do you have a picture to add? People love to see who is behind a business. Or maybe you have a great before and after organizing photo. Interested in a Christian Professional Organizing Association? Check out Faithful Organizers an International Association of Christian Professional Organizers who provide organizing services, seminars, retreats and workshops around the world. For a list of Organizers who belong to the National Association of Professional Organizers, visit the NAPO Web site.